Real jewels may break the bank, but these affordable chocolate jewels from Barlovento Chocolates are just as lovely, if ephemeral. Photo by Katharine Pollak | THE NIBBLE. 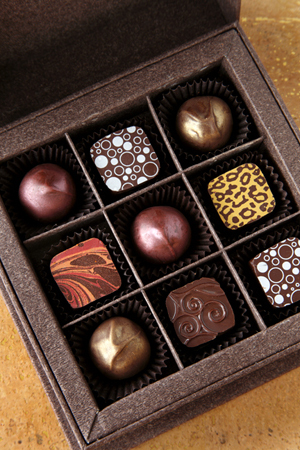 WHAT IT IS: Artisan chocolates from four American chocolatiers. WHY IT’S DIFFERENT: Each chocolatier has a different approach to handcrafting chocolates. 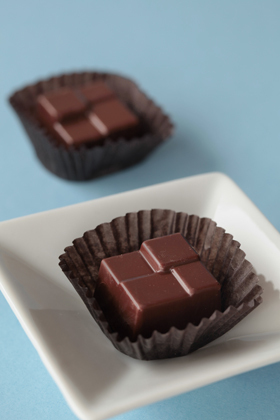 WHY WE LOVE IT: We love that American artisans make such beautiful and delicious chocolate! WHERE TO BUY IT: See individual reviews. CAPSULE REPORT: We know we did a piece on chocolate last week. So forgive us, but Mother’s Day is less than three weeks away. And it’s the second-biggest chocolate-buying holiday after Valentine’s Day. What does it take to get chosen as a Top Pick Of The Week chocolate? Quality, consistency and good service. There are wonderful chocolatiers out there who don’t yet have the resources to provide good customer service for online orders. Are you ready to discover a wonderful new chocolatier? Read the introduction below to see why you should try these chocolates. Also see American’s Artisan Chocolatiers Parts I to V. There won’t be a Chocolatiers Part VII for Father’s Day, so consider these for Dad as well. Top Pick Gifts That Aren’t Chocolate! 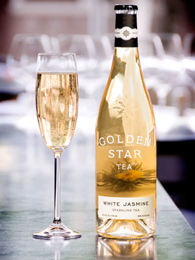 Golden Star Jasmine Sparkling Tea. Send Mom a case of this wonderful, non-alcoholic drink that’s as fetching as sweet Champagne. It’s an alcohol-free high. Read the review. Yummy Cupcakes. 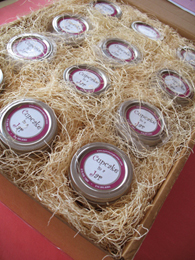 If Mom has a sweet tooth, she’ll love these cupcakes-in-a-jar. The Mason jar keeps them fresh, so you can enjoy some every day. Read the review. Jeni’s Splendid Ice Cream. 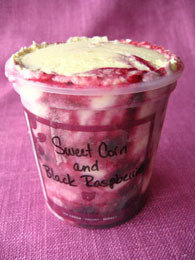 Ice cream doesn’t get better than this! We’re always pining for some pints of Jeni’s. Send a gift selection to Mom. Read the review. Low calorie, sugar-free, gluten-free, cookies, and of course, more chocolate. It’s National Soft Pretzel Month. Your friends and family will be most impressed when you serve them pretzels hot from the oven. That’s a true characterization of your typical small-scale chocolatier in these days of intense competition. Most of these artists toil in relative obscurity, trying to establish a name for themselves among the swirl of publicity that always surrounds mass-produced, well-known brands with much deeper pockets. Given the good quality of their products, these “little guys” deserve far better recognition, and it’s my hope that this article, and others like it, will allow you to find a new favorite or two worth supporting. Chocolatiers are listed in alphabetical order in the index box above. From Nunu Chocolates, Mezcal Chili combines three great indigenous Mexican ingredients: chocolate, chili and mezcal, a spirit derived (like tequila) from the agave plant. Photo by Jerry Deutsch | THE NIBBLE.